So, as much as I loved the pear, the rest of my family did not. 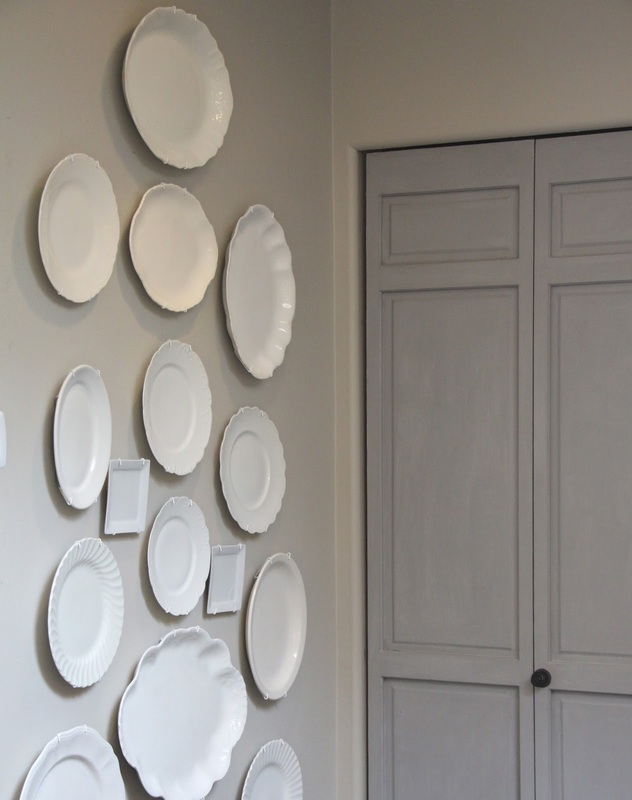 So I went back to something I love, a neutral plate wall. I have a huge collection of ironstone, so that was a good starting place. I always pick these up at garage sales or thrift stores she I see them. Here is how I came up with an arrangement. I laid some pieces on the floor in a pattern I thought looked good. Then I roughly measured the height and width. Mine came out to be about 38" wide x 61" tall. 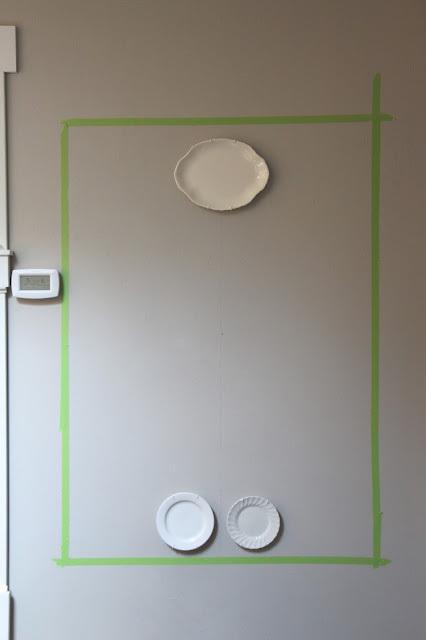 Then I taped off that height and width on my wall, centered with painters tape. This is the area I would be working in. To find the center you need to measure the height and width of your wall. Mine is 53 1/2" wide by 95" tall. 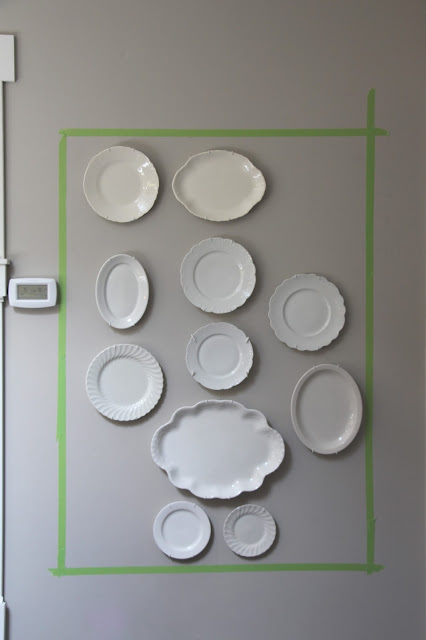 Now, subtract the width of your plates by the width of you wall. Now divide that by 2 which is 7 3/4"
That is your mark you will make on the left and right with your tape. 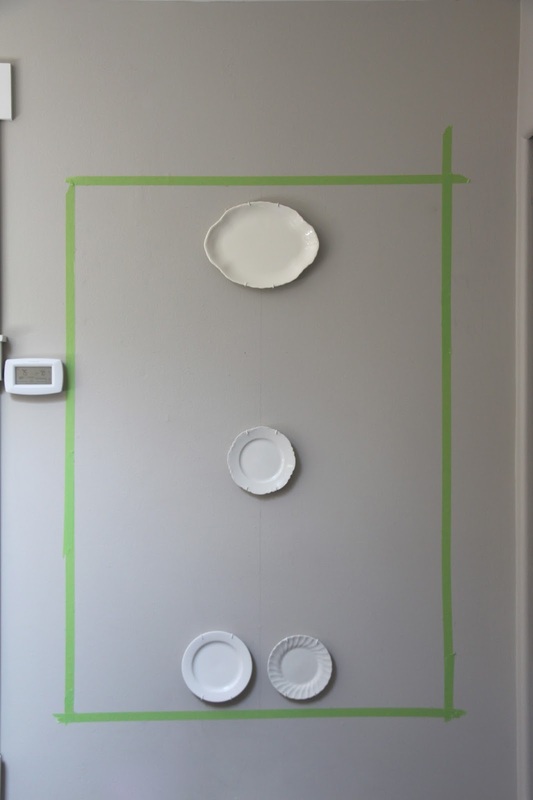 Do the same for the height and mark with tape. You now have your area to work in. Then divide the width of your "tape wall" in 2. Mine was 53 1/2 , so that makes it 26 3/4"
This is your center line. 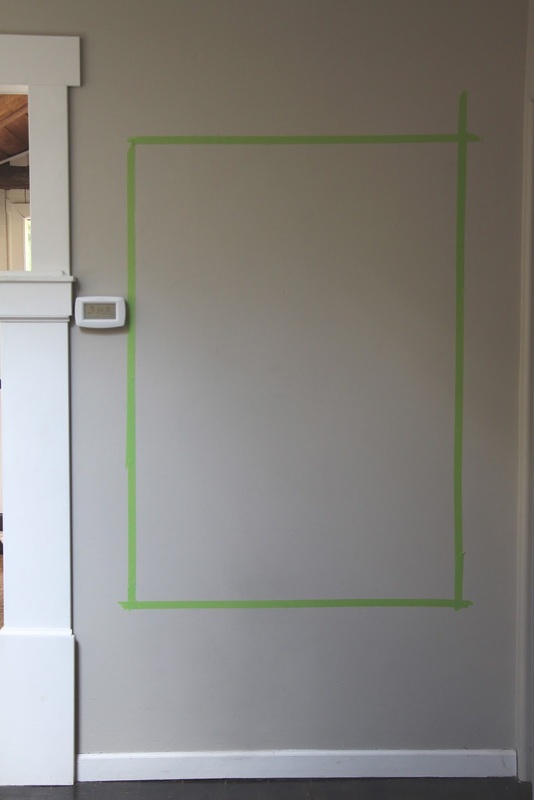 Using a level and a pencil, make a light center line down your wall. I started with the top plate. Almost to the top and then right on that center line is where my nail went in. Next, do the bottom plates. Then I did the center one…. And then just started filling in from there. And here is the most helpful tip when doing this plate wall so your walls don't look like swiss cheese. Put a dab of toothpaste on the center back of each plate where your plate holder will hold the nail. 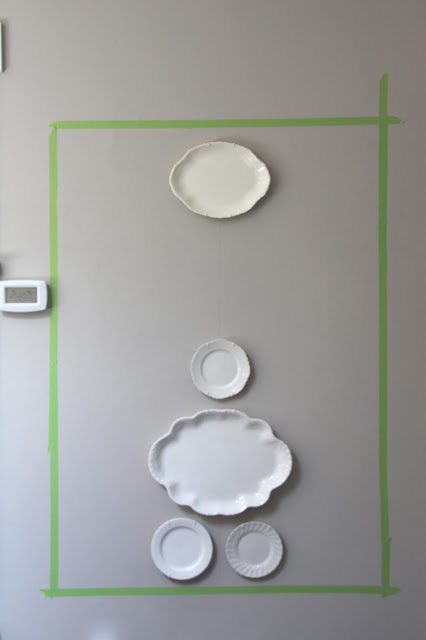 Hold your plate where you'd like it go without touching the wall until you find the perfect spot then gently tap the plate against the wall. This should leave a small toothpaste mark to indicate where you should insert a nail. Wipe away any leftover toothpaste once the nail is in. 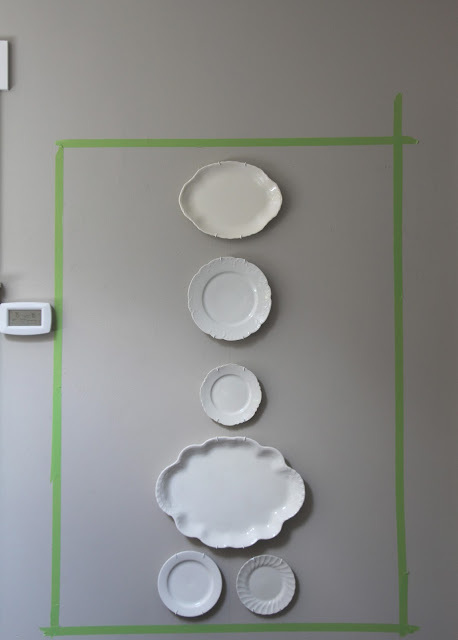 Once all your plates are up, remove the tape and stand back to admire. At this point you may see places where you'd like to fill in the gaps. I did, and quickly went to the dollar store and TJ Maxx to get some small plates. I still may add a few more over time. I also like this idea that Layla did with layering. Ok, phew, I think I am done redecorating this room for a while now! The plates look great, but that pear art made such a nice impact. I love large statement pieces. I'm curious where you'll move it to, and hope you share a picture with us. Love it, it looks totally amazing. What did you use as a plate holder? The plate holders I see in stores, you can see the holder when the plate is hung. It looks unbelievable - I cannot imagine hanging all of these…gorgeous! Hope you're having a great start to your week! I'm obsessed with plate walls & this one is PERFECTION!! Loving the crisp look of the neutral, clean whites!! Gorgeous!!! Sorry but the pear looked SOOOOO much better! I LOVED the pear! But then I love all thingd "pear". I have a wonderful displayed collection of all kinds of vintage and new ceramic, stone and resin pears in all colors and sizes in my living room. I have two beautful handpainted pear plates in my bookcases in the den and I have a huge pear wire sculpture on the wall in my kitchen. Of course I have various other little tea cups, dessert bowls, plates, spoon rests and on and on with pears on them. 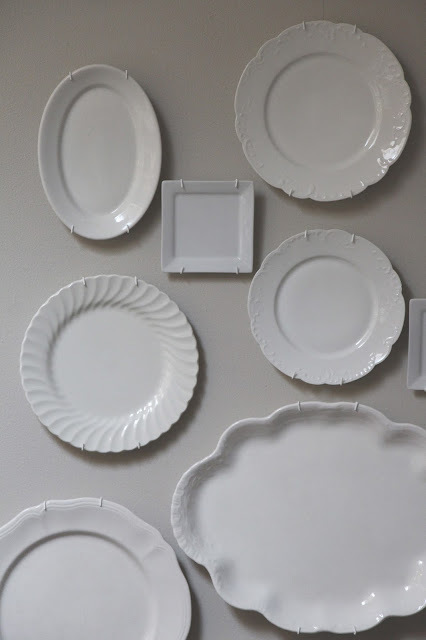 BUT, your wall of plates looks FABULOUS! The plates are perfectly displayed in a design that is especially pleasing to the eye, great movement and variation an size and style. 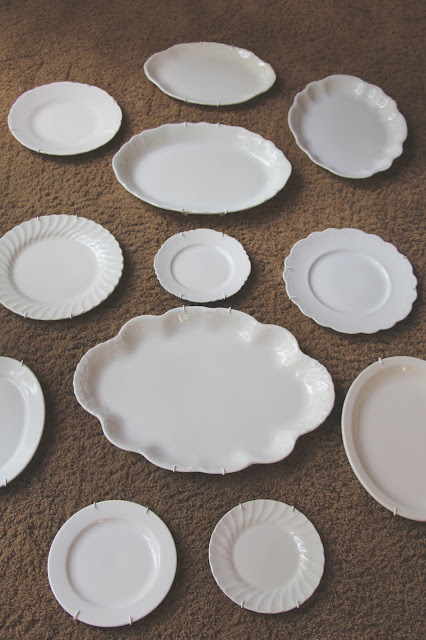 I have a bunch of pear plates that might makes a great display on a wall in kitchen or dining room. Thanks for the tips and your guide. 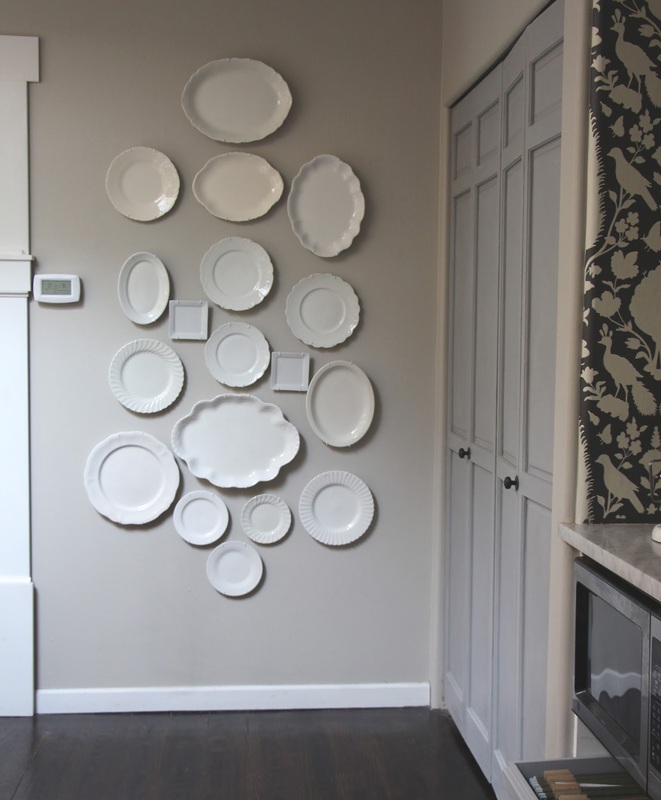 I've always had a thing for plate walls! Love the monochromatic neutral look. Can you tell me if you painted the plate hangers white or were you able to locate white ones? That's the thing I always disliked about using plate hangers--you can spot the gold tips a mile away. I love the adhesive backed disc plate hangers, but they're awfully pricey if you are doing a large grouping. Where did you get your adhesive plate hangers? Was it at Michaels or Hobby Lobby? Thanks. Love your ideas. Hope to hear from you. Obat AmbeJoss Dan Salep Salwa ? Segera Hubungi Kami Dan Pesan Obatnya Sekarang Juga di Fast Respond : 087705015423 PIN : 207C6F18. Obat Wasir Stadium 2SP>? Segera Hubungi Kami Dan Pesan Obatnya Sekarang Juga di Fast Respond : 087705015423 PIN : 207C6F18. Government Careers are hugely popular amidst the children of the country due to the long-term balance and unparalleled working environment they provide. PSUs or Open public Sector Undertakings are one of the most significant employers in conditions of headcount and gross annual turnover. These businesses course across different industries such as Bank, Olive oil & Gas, Healthcare, Education, Security, Energy, Processing & a lot more, all critical to the development of the nationwide economy. They give a variety of occupations to prospects of different caliber and educational qualifications. Whether you are a graduate or a Ph.D. scholar, a supervisor or an engineer, there are many PSU vacancies for everybody.